The Loretto Chapel in Santa Fe, New Mexico, is the oldest Gothic-style church west of the Mississippi River. It incorporates what some claim is a divinely built staircase. In about 1853, French American Archbishop Jean Baptiste Lamy engaged two French architects to design and build a cathedral in Santa Fe, which had become part of the United States in 1848. During the construction of what became St. Francis Cathedral, the architects also designed a chapel for use by local members of the Sisters of Loretto, the first order of nuns established in the United States. Artisans imported from France and Italy assisted local carpenters in building the Gothic-style Loretto Chapel, modeled on Paris’ Sainte Chapelle. According to a story reported long ago by the Sisters of Loretto, when the chapel was completed in 1878, it relied on a narrow ladder to reach the choir loft. When local carpenters were unable to construct a suitable stairway in the small space, the nuns prayed to St. Joseph, the patron saint of carpenters, for a solution. On the final day of their novena, a nine-day prayer vigil, a carpenter with only a hammer, a saw and a square showed up leading a donkey. After a few months in 1879 working in private inside the chapel, the carpenter left without seeking compensation. After the nuns saw the circular staircase the unknown carpenter had created, they sought to learn his identity. When they were unsuccessful, the nuns believed that the mysterious carpenter might have been St. Joseph himself. The staircase (not including the later-added bannister) comprises 93 pieces of wood of unknown origin. The staircase makes two 360-degree turns and includes no central support and no nails. 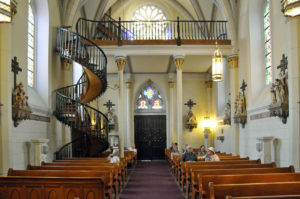 Engineers still argue about the structural principles underlying the so-called “Miraculous Staircase” of Loretto Chapel, now a private museum.